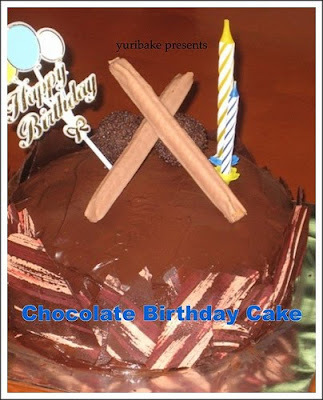 Yuri's Bake Journal: Another Year! Inspirational! Thanks to all who inspired the birth of this journal. How quickly time has flown by, it's another year. My cyber friend was surprised when I told her that I had to rush home to bake a birthday cake for my son. He turned 11 today and I baked him this super and wonderfully chocolatey cake. Admittedly, it is far too chocolatey for my daughter and I. Hubs and son both enjoyed the cake, though. On hindsight, perhaps I should have let it remain a chocolate banana cake or added something else, such as dark cherries, in the middle. I am not complaining that the cake is too sweet, though. I had used Belgium couverture chocolate both for the cake, as well as the ganache. Perhaps that had contributed to the intense (son said it was bitter) chocolate sensation. I'm sure any chocolate lover would love this. To keep decoration to a minimum, I simply placed 2 Ferrero Rondnoir and 2 sticks of Bourbon cocoa crepe cookies at the top of the cake. For the sides, I broke up some chocolate transfer. It's also a small cake, just 6-inches in width. I had learnt this from a baking class and I knew this was the cake for my son this year. Again, he had wanted a cake from the store but I managed to convince him to let mummy bake for him. Then I felt stressed, do mummies all feel this way? I'm glad it turned out ok. In exactly 2 weeks' time, it will be my daughter's birthday. She had requested that her cake be "special", now, what happened to any cake baked by mummy would be special ... aren't children hard to satisfy these days? I will definately like this dark and rich chocolate cake. Happy birthday to your dear son! FTWM of 2 who is a novice in the delicious world of baking. Praise God for guiding me to the joys of baking!